Our major market indices soar up again. Several members of our Fab50 collection achieve new record prices. Game of Thrones arrived on the secondary market but winter is gone, as this is our price update for February 2019! This month we observed more than 13.000 bottles of whisky changing their owner. 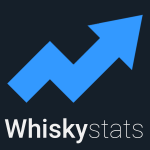 On average 420 Euros have been paid and no less than 7.000 whiskies in our database experienced a price change this month. With 113 trades the Macallan Concept Number 1 was by far the most traded release of them all. These prices averaged to around 150 Euros. We count five Macallan releases among the ten most traded whiskies of February 2019. But let’s have a look at the broader picture. 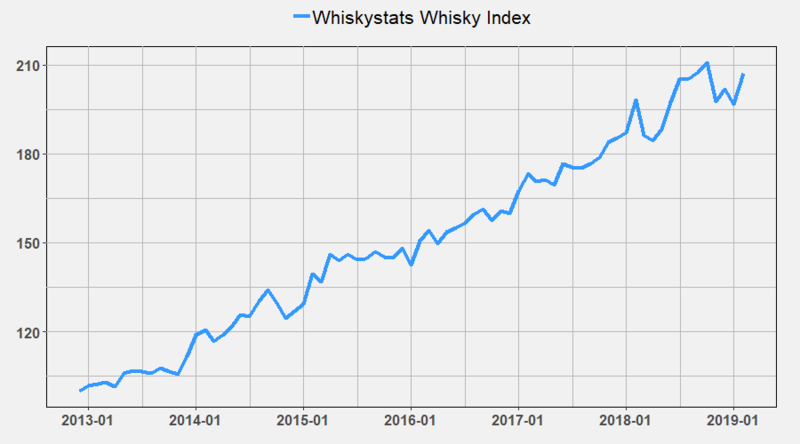 Our major market index, the Whiskystats Whisky Index (WWI), gained 5,3% and now stands at 207,2 index points. This means that the 500 historically most traded whiskies gained 5,3% in value this month. This brings the WWI very close to its all-time peak of 210,7 index points which it reached just in October 2018. Due to the methodology we are using to calculate the WWI you will never find a real whisky collection that will perform just like this index. The reason is quite simple. The list of whiskies that contribute to the WWI can change each month. That is why we also tend to look at what we call the Fabulous 50, a hand selected collection of 50 very rare and very collectable releases. 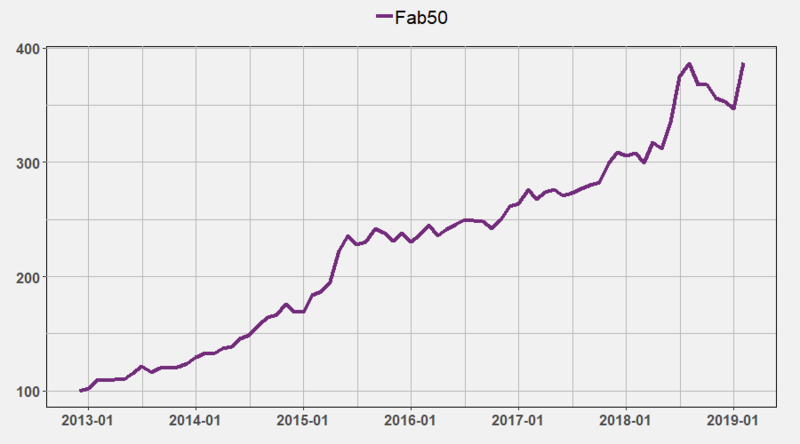 From August 2018 to January 2019 the Fab50 collection lost almost 12% in value. After the total collection worth increased by 24% from May to August 2018 this seemed like a reasonable price consolidation. And now, in February 2019, we see an incredible increase of 11,7%! The whole Fab50 collection is now worth almost 123.000 Euros. So naturally the question arises of which bottles caused this turnaround? One of the major drivers is the Karuizawa Single Cask 6426. Once released to celebrate the 10th Anniversary of the Whisky Exchange this japanese single malt traded for more than 17.000 Euros this month. Other Fab50 members with a decent price increase are the Glenlivet 25yo Royal Wedding and the Talisker 25yo 2001 Release. It was only in autumn 2018 when the Talisker was regularly traded for around 650 Euros. Now, only a couple of months later, the price tag reached almost 900 Euros. Of course there were also some value-losers this month. One prominent example is the Lagavulin Game of Thrones (House Lennister) edition. But actually it is not so much the 68 Euros this whisky achieved this month. It is the 260 and 450 Euros from the previous months that catch our attention. We regularly observe horrendous prices for new releases, but why someone would pay so much when the whisky is available in pretty much every online shop we cannot tell. Do not forget to check the latest changes in value of your very personal whisky collections too! The new database is online! It is not only bigger and more precise than the old one but gives us the technical foundation we need for the great things to come. But first things first, here is the introduction to our new database.. This topic contains 0 replies, has 1 voice, and was last updated by Whiskystats 1 month ago.